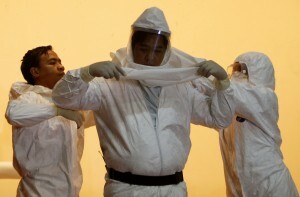 WASHINGTON — People who shared an apartment with the country’s first Ebola patient are emerging from quarantine healthy. And while Thomas Eric Duncan died and two U.S. nurses were infected caring for him, there are successes, too: A nurse infected in Spain has recovered, as have four American aid workers infected in West Africa. Even there, not everyone dies. The end of quarantine for 43 people in Dallas who had contact with Duncan “simply supports what most of us who know something about the disease have been saying all along: It’s not that easily spread,” said Dr. Joseph McCormick of the University of Texas School of Public Health. Formerly with the Centers for Disease Control and Prevention, McCormick worked on the first known Ebola outbreak in 1976 and numerous other outbreaks of Ebola and related hemorrhagic viruses. Ebola spreads by contact with bodily fluids, such as through a break in the skin or someone with contaminated hands touching the eyes or nose. Once inside the body, Ebola establishes a foothold by targeting the immune system’s first line of defense, essentially disabling its alarms. The virus rapidly reproduces, infecting multiple kinds of cells before the immune system recognizes the threat and starts to fight back. It’s not clear why Ebola runs a different course in different people. But how rapidly symptoms appear depends partly on how much virus a patient was initially exposed to, McCormick said. The World Health Organization has made clear that there’s far more virus in blood, vomit and feces than in other bodily fluids. Profuse vomiting and diarrhea can cause dehydration. Worse, in the most severe cases, patients’ blood vessels start to leak, causing blood pressure to drop to dangerous levels and fluid to build up in the lungs. “The key issue is balance between keeping their blood pressure up by giving them fluids, and not pushing them into pulmonary edema where they’re literally going to drown,” McCormick said. “We depend on the body’s defenses to control the virus,” said Dr. Bruce Ribner, who runs the infectious disease unit at Atlanta’s Emory University Hospital, which successfully treated three aid workers with Ebola and now is treating one of the Dallas nurses. “We just have to keep the patient alive long enough in order for the body to control this infection,” he said. What about experimental treatments? Doctors at Emory and Nebraska Medical Center, which successfully treated another aid worker and now is treating a video journalist infected in West Africa, say there’s no way to know if those treatments really helped. Options include a plasma transfusion, donated by Ebola survivors who have antibodies in their blood able to fight Ebola, or a handful of experimental drugs that are in short supply. But survival also can depend on how rapidly someone gets care. It also may be affected by factors beyond anyone’s control: McCormick’s research suggests it partly depends on how the immune system reacts early on — whether too many white blood cells die before they can fight the virus. Other research has linked genetic immune factors to increased survival. Lauren Neergaard is an Associated Press reporter.